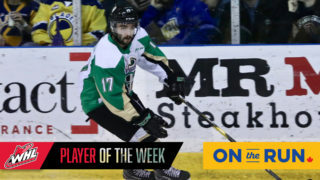 Saskatoon, SK – Dante Hannoun had a hat trick to lead the Prince Albert Raiders to a 6-3 win over the Saskatoon Blades on Sunday evening at SaskTel Centre in Saskatoon. With the victory, the Raiders won the best-of-seven series four games to two to advance to the Eastern Conference Championship. Noah Gregor and Brett Leason also chipped in offensively with a pair of assists each. 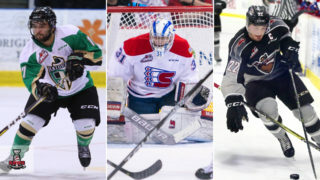 Parker Kelly, Aliaksei Protas, and Sean Montgomery also scored in the win. The Raiders had the best of the early chances in the game, beginning with a backdoor pass put just wide of goal by Hannoun. On an early penalty kill situation, Leason was turned aside on a breakaway, while Montgomery sent a snapshot from the slot wide. Kelly opened the scoring midway through the first period after forcing a turnover by Blades captain Chase Wouters at the blueline. 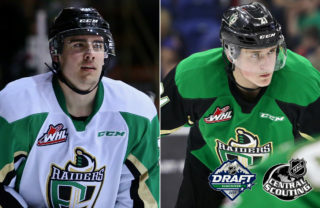 The Ottawa Senators prospect streaked down the wing and picked the far corner on Nolan Maier for his fourth of the WHL Playoffs with 9:32 to play in the opening frame. 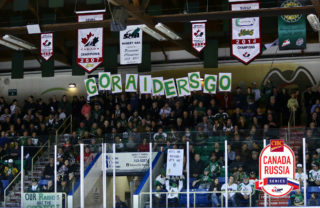 On a Raiders’ power play, the Raiders generated more quality chances led by Gregor’s rush through the Blades defence. However, Maier made the save with his glove. Late in the period, the Blades evened the score. With Zack Hayes in the box for tripping, Ryan Hughes’ point shot from the point found its way through a screen in front of the goal and past Ian Scott with 3:15 left in the first. Before the final buzzer of the opening frame, Montgomery was denied again when his shot from the slot was kicked away by Maier’s left pad. In the second, the Raiders regained their lead 5:08 into the frame. Gregor skated behind the goal to the slot and fired a shot that went off both posts and along the goal line. Hannoun was at the side of the goal and banged home the rebound for his seventh of the post-season. Three minutes later, Aliaksei Protas extended the lead to two by finishing off a tic-tac-toe passing play. Kaiden Guhle started it by hitting Leason with a cross-ice pass. Leason then found Protas at the side of the net who buried his fourth of the playoffs at the 8:18 mark. The Blades cut into the lead with 4:36 to play in the second. After Hughes drew a tripping penalty, he skated into the centre of the zone and fired a shot on goal that got past Scott for his second power-play goal of the game. Early in the third, the Raiders upped the pressure while looking to restore the two-goal lead. Leason was sprung on a partial breakaway, but Maier made the save. Two minutes later, Montgomery extended the Raiders’ lead to three. With Max Gerlach in the box for cross-checking, Montgomery snapped a shot through Maier’s five-hole at the 5:27 mark of the period to make it 5-2. About 30 seconds later, the Blades cut back into the lead. Tristen Robins redirected Nolan Kneen’s shot through Scott to bring Saskatoon back within two at the 5:56 mark. 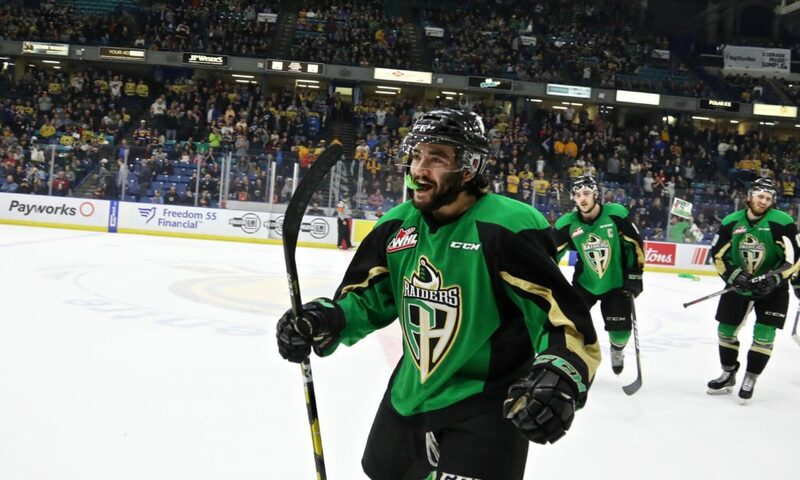 The Blades kept pushing, but the Raiders were able to keep the home team at bay. A Riley McKay penalty with 3:08 to play ended the Blades’ chance for a big push. With 1.3 seconds to play, Hannoun completed his hat trick to ice the game at 6-3. Scott finished the game with 19 saves for the win. Maier had another strong game in goal, stopping 26 shots. 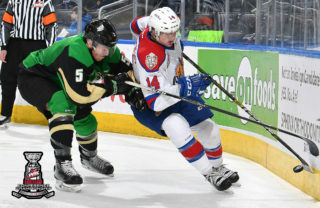 The Raiders are off until Friday night when they open the Eastern Conference Championship at the Art Hauser Centre against the Edmonton Oil Kings. Game 2 of the series will be played on Saturday night. 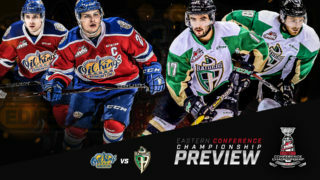 Both games begin at 7 p.m.
Tickets for the series will go on sale at the Art Hauser Centre box office at 9 a.m. on Tuesday morning. A limit of six tickets per patron is in effect. Online sales begin at 10 a.m. on Tuesday.